Sometimes the best way to create a brighter future is to go back to your roots. 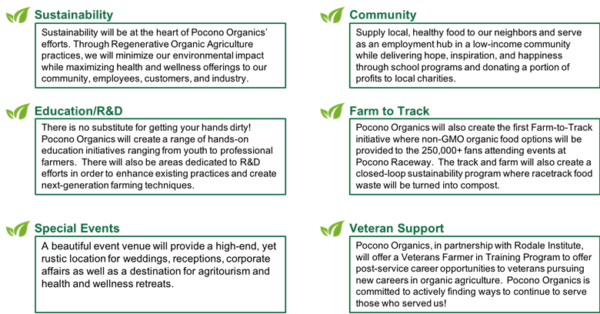 That’s the vision for Pocono Organics. Once a thriving spinach farm in the 1940s, the operation is now poised to be one of the first and largest public-facing regenerative organic farms in North America. The 50-acre organic farm is the vision of Ashley Walsh, a third-generation business leader in the Mattioli family who learned first-hand from her grandfather and Pocono Raceway founder, Dr. Joe Mattioli, that a big vision could create progress, and progress could create change. “What started out as a lifestyle and health choice for my family and I became a larger mission when I thought about how we could utilize our land to grow organic food to help others, create jobs in our community, and ultimately become an example of what a fully sustainable regenerative organic farm could be,” said Walsh, president of Pocono Organics. Pocono Organics is designed to be self-sustainable in order to reduce its environmental footprint. Constructed to LEED standards, the farm will draw its power from the 3MW 25-acre solar farm that also powers Pocono Raceway. Organic crops, such as fruits, grains, herbs, vegetables and flowers will grow in both outdoor fields and in nearly 40,000-square-feet of greenhouses. Water for these crops will be reclaimed rainwater that will be collected and filtered through a living, vegetative roof atop the “State-of-the-Art Barn,” a nearly 30,000-square-foot processing and storage building attached to the greenhouses. Pocono Organics will also install its own septic and well water systems. Rodale Institute is the global leader in regenerative organic agriculture and is a non-profit organization dedicated to pioneering organic farming through research and outreach. The Institute has been putting science behind best practices in organic agriculture for more than 70 years. Together, their vision is to turn Pocono Organics into a model sustainable and regenerative organic farm. 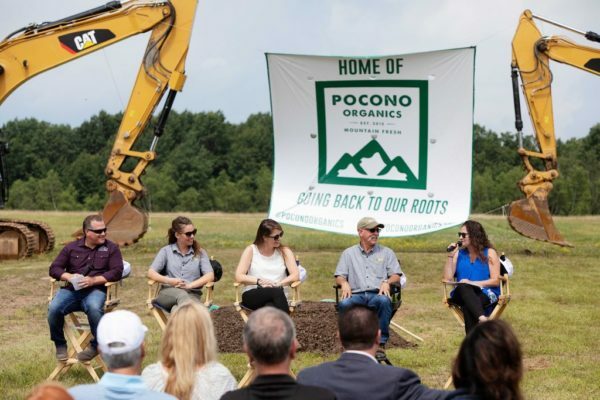 Pocono Organics expects its first crops to be ready for harvest in late spring of 2019.